Ah, Germany. The land of long lists of rules and home to 80 million devoted rule-followers. 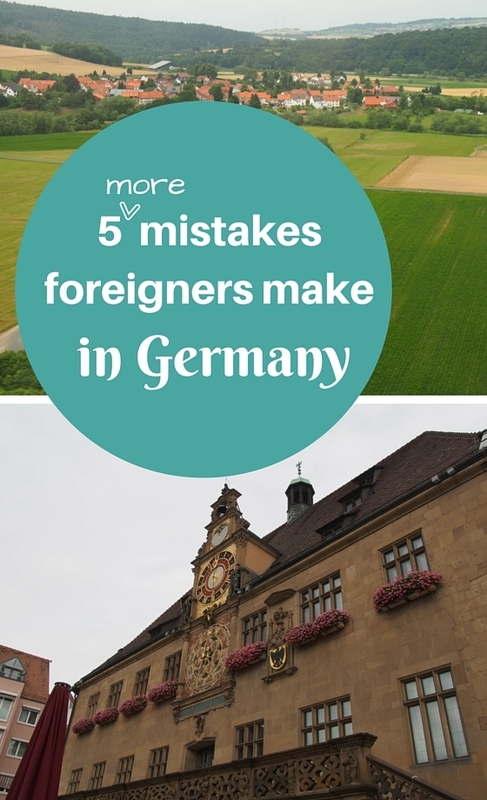 The rules are one of the reasons I love Germany, but as you may remember from last year’s post on the 5 funniest mistakes foreigners make in Germany, the abundance of rules does lead to a high number of mistakes! After returning for a visit again this year, along with getting numerous messages from readers of last year’s post, I realised I already have enough material for another whole post about the errors we non-Germans can unwittingly make. 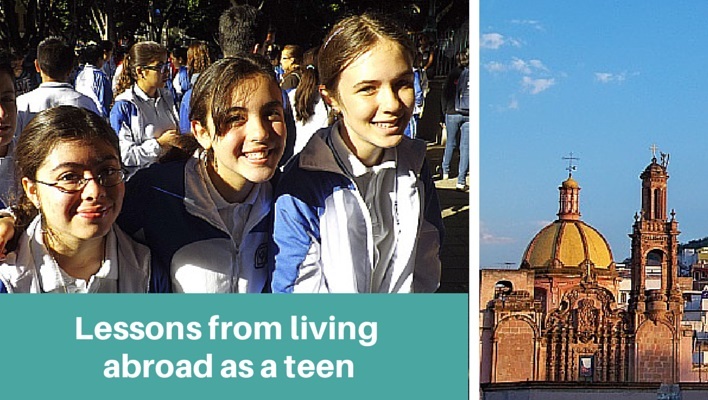 So here goes – and take good notes if you’re headed to Germany any time soon. I can’t believe I actually forgot this one in the first post. As an Australian who lives surrounded by green parks which we walk across daily on the way to school, this rule is almost distressing! But it’s true – in many parks in Germany there are either signs saying that you need to keep off the grass, or it is simply implied and nobody would walk on the grass. According to my German husband, this is probably because a lot of the lawns planted in parks across Germany aren’t as robust as the ones we’re used to here in Australia, and they wouldn’t survive well being trampled across constantly. Hmm. Might be true I guess? 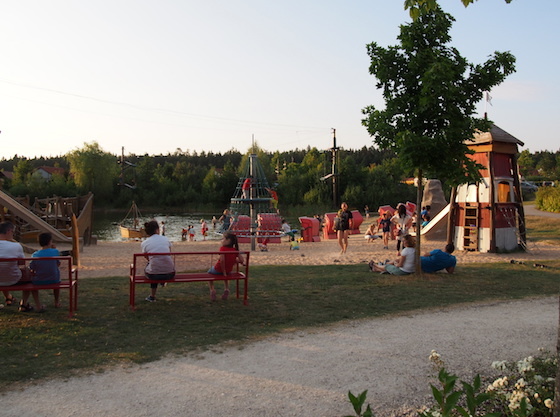 Some German grass near Legoland – but this lot we could walk on! My husband still abides by this one, even though as far as I can figure out it arises purely from superstition. If I plan my son’s birthday party to fall before his birthday (common in Australia – and often important for my son as his birthday is close to Easter and the school holidays so it’s really hard to find a suitable party date! ), there is all manner of consternation. So, the rule is – don’t wish someone a happy birthday ahead of the day and definitely don’t celebrate in any way before their birthday actually arrives. Although it’s also important to know that in Germany, if it’s your birthday, you’re expected to be the one who supplies cake. One of my readers, Sue, told me a funny story – she was working in Germany and her birthday was on a Saturday. She knew the rule about bringing cake, so she brought some – but on the Friday before her birthday! Her colleagues, she said, were appalled! I’d forgotten about this until a reader called Jessica told me about an incident she experienced in Germany, and then I remembered having the same thing happen. I was parked somewhere waiting just for a minute with the engine still running – I can’t quite remember why, but I know it was just for moment – and a man came up and rapped on my window. When I wound it down he told me off for having the engine running and said I should turn it off immediately! I certainly never left my car engine running again – in fact, at traffic lights, Germans often turn the engine off while the lights are red. They have an orange light before the red light so you’ve got time to turn it on again – which is important, because in my experience if you don’t start driving as soon as the lights go green, you get honked! I got quite the surprise when I first moved to Germany and my new boss helped me look around at potential flats to rent. Most of them had no kitchen! That is to say, they had a room that would be designated as a kitchen, but they didn’t even have the basics like a sink. So while it’s not like there are no kitchens in Germany, it was definitely expected that I would fit it out completely myself. And in the end (mostly since not many landlords wanted to take on a peripatetic foreigner who might not stick around long) I had to rent a flat without one and buy a very basic kitchen to get by with. The theory is that it’s quite common in Germany to rent the same flat for many, many years, so this kind of makes sense. Except it’s certainly not very convenient for people who aren’t planning to stay a decade! My apartment was here – and it came without a kitchen! It won’t be a surprise to anyone that I mention punctuality in conjunction with Germans, I’m sure. But the reason I mention it is because there are a couple of specific reasons that can mean foreigners end up being late accidentally – I know this, because this happened to me more than once! It’s most likely to happen after you’ve been there for a while or if you already have some grasp of the language. Across Germany, if they want to talk about a time that is (for example, to us English speakers) “half past three”, the German language uses words which translate to “half four”. Given that I have British friends who actually use the phrase “halb vier – half four” to mean “half past four”, they would be even more confused, but even for me, I always have to think twice about “translating” the time. And if you’re in a hurry or not paying close attention it’s easy to get muddled and arrive an hour late. In some parts of Germany – and especially in Swabia/Schwabenland where I lived – they have an additional confusion which really got me tricked because I could never remember what it actually meant. They say, for example, “drei viertel sechs – three quarters six” – and this actually means “three quarters of the way to six”, or 5.45. I once had a car full of people waiting an entire hour for me to show up to meet them because I got completely bamboozled by this phrase! 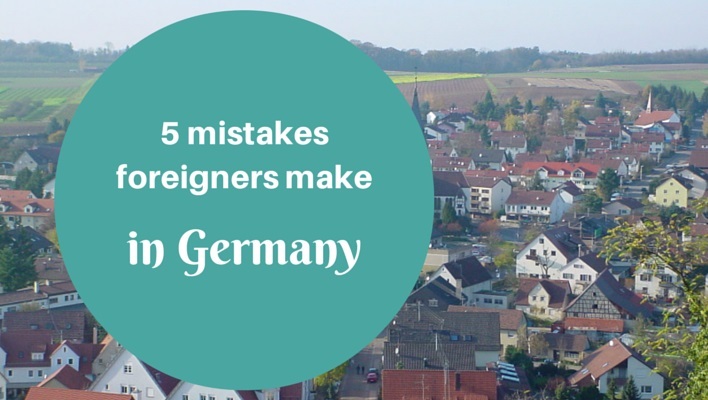 Do you know any more mistakes foreigners make in Germany? I’m sure there are more. Tell me about them? I’m wondering if I can come up with enough traps that foreigners fall into to compile yet another post on this issue next year! I grew up in Switzerland and we have a few similar idiosyncrasies but I’ve never come across an apartment without a kitchen – that’s just weird! The whole time thing confuses me in every language, including the english version of half six – is that six thirty or five thirty? Yes, the lack of a kitchen really took me by surprise too – I will be interested to see if that’s just a south-west German thing or is all over – hopefully someone will tell me! And yes I am constantly confused by my English friends who say half six etc. In fact I have a friend from England who is married to a German, and we met at German playgroup where we had to speak German to each other, but now usually speak English – so I’m constantly confused! But they are opposite to German, so half six means 6.30 to an English person. Well I think that’s right – help??!!! In the north of Germany there are many apartments without kitchens too Amanda. I remember going to see one to rent and the previous renter wanted us to pay for his still “newish”kitchen that had cost him an absolute fortune (at least to us young couple)! I remember thinking – who buys a fancy kitchen for a rental? Anyway we said we couldn’t afford it and would rather look at another place and he let it go. 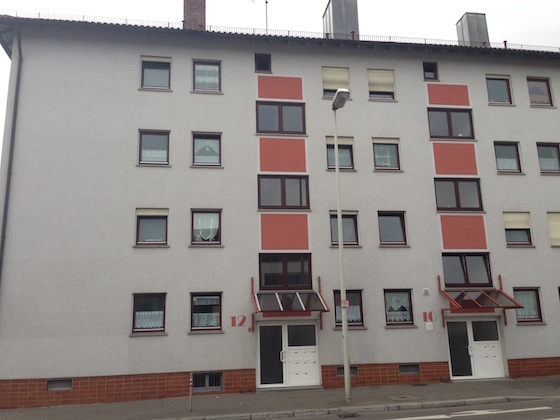 Your apartment building looked quite similar to the one we lived in, in Braunschweig. I also remember being told off for walking on the grass, and the same happened in Paris! Oh I didn’t know that! 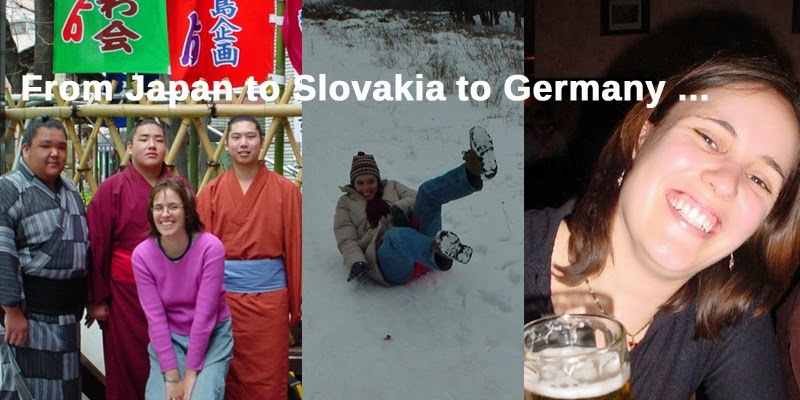 (My Slovak was never that advanced!). I think the problem with German was I felt like I was pretty fluent so I always assumed I knew what time they meant – and then sometimes I had mistranslated in my head without realising. Because it’s so confusing!!!! The kitchen one is a new one to me. Inever came across a flat that didn’t have a sink, there may be no white goods, but otherwise.. Another mistake non Germans make is to cross when pedestrian traffic lights are red.Doesn’t make much sense when there is absolutely no car around which could run you over, but there you have it; we Germans and our rules. Inka, the kitchen thing is odd, I now have heard from people in both northern and southern Germany that they’ve had the same scenario, but it doesn’t seem to be absolutely everywhere – I’m still getting to the bottom of it! And yes, I remember waiting for ages on absolutely empty streets until the lights changed because I was walking with Germans! I lived in Germany several years in the 80’s and 90’s, my father was in the Army. We were told that in the apartments, that Germans considered the kitchen cabinets as furniture. So if they moved they would take all of their furniture to their next apartment. I am guessing this is why IKEA is so popular. Also, I do believe they take all of the lighting fixtures. My experience in Bavaria. Just stumbled upon your blog and found both your 5 German rules posts – hilarious!! Loved them! So much truth in them (I grew up in Berlin but have lived in Australia for just about forever…). Yeah, the kitchen thing… totally true. Some apartments have them but that’s usually because the owner/previous renter left them. I remember when we moved a few times, our kitchen came with us and got re-modelled. Or we “simply” bought a new one. In Australia, I still can’t get over the fact that you’ll even have curtains in a rental – curtains! Can I please choose my own, thank you! 😉 (In fact, I have actually stuffed curtains into plastic bags, hidden them in cupboards and then stalked off to Ikea to buy myself my own for rentals in Melbourne…). Thanks Kati! Yes just “simply” buy a new kitchen – love it!! And I can see how having to put up with other people’s taste in curtains etc is weird (and for that, the German way is probably much more sensible!). I have to admit I still struggle to jaywalk too. Those years in Germany were enough to change me! And my son (who is half-German so it’s genetic for him!!!!) definitely can’t. One of the things that I had the most trouble with was knowing which side of the street to park on and on which days it was ok to park there do to their obsession with street cleanong, lol! Got a few tickets before I figured it out! Oh yes! I’d forgotten about that issue!! I think I was lucky and never got fined but that was a crazy system.